The 2017 African Marine Waste Conference took place from the 9th to the 13th of July in Port Elizabeth, and was attended by approximately 200 delegates from 9 African states and a further 10 countries from other continents. The inaugural African Marine Waste Conference was managed by the Sustainable Seas Trust (SST) under the leadership of Dr Tony Ribbink, CEO of SST, and aimed to continue the concerted effort of better managing marine litter with the help of governments, NGOs, researchers and other stakeholders across the African continent. Plastics|SA hosted the first two African Marine Debris Summits that took place in Cape Town in 2014 and 2016 with the support of UNEP (United Nations Environmental Programme), the Department of Environmental Affairs and SANBI (SA National Biodiversity Institute), and also participated in the launch of the African Marine Waste Network that took place in Port Elizabeth in July last year. “This year’s conference built on the initiative started three years ago to create a platform for African and international delegates and experts to discuss issues relating to marine waste around the African continent, including data and research, capacity building, prosperity through the development of economic enterprises centred on waste management, education and awareness and the role of the consumer, government, industry and municipalities. The focus at this year’s event was on finding innovative solutions that would cater to African circumstances and cultures and using opportunities to shape a brighter future for the human health, economies and environments of Africa,” explained Douw Steyn, Sustainability Director at Plastics|SA. In addition to presentations, panel discussions and parallel sessions, workshops on microplastics, data and research, and mobile applications were also held over the duration of the conference. 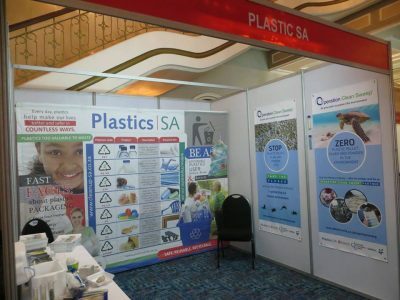 Plastics|SA chaired an industry workshop featuring participants from various sectors. Industry representatives, scientists, educators, waste disposal experts and the maritime sector were encouraged to engaged in a debate which aimed to identify the issues that have the biggest impact on the marine environment. Communication between industry members needs to be improved in order to integrate fragmented initiatives, avoid duplication and promote best environmental practices. Focus should not be exclusively on packaging companies but should expand to include the maritime industry. Alliances and partnerships between sectors are also lacking and current public partnerships are too few and ineffectual. Industry needs to collaborate more openly and sincerely. Knowledge gaps in technology and data should be addressed. Recycling levels in South Africa and the perceived value of waste should be improved. Clear master plans need to be developed with tangible outcomes within specific timeframes and with impactful marketing plans to increase participation and buy-in by the general public. “The plastics industry has long been involved in efforts to reduce plastic marine litter, from conducting research to enhancing product stewardship to cleaning up beaches. As the umbrella body representing the entire South African Plastics industry and a signatory of the Declaration of the Global Plastics Associations for Solutions on Marine Litter, Plastics|SA will continue to support and collaborate with industry efforts aimed at combatting marine litter. We recognise that there is still a lot of work that needs to be done, but look back at very big inroads that we have already managed to make to address the problem head-on and offer real solutions. If we continue to take the right steps, we believe that waste can indeed become profitable to countries of Africa. The environment, human health and tourism are but a few areas that stand to benefit significantly if we are to devise a workable strategy for managing waste in and around our continent,” Steyn concluded. The next African Marine Waste Conference set to take place in 2019. For more information or a detailed report about this year’s conference, visit https://africanwastenetwork.org.za or www.plasticsinfo.co.za.